SOME OF THE PEOPLE DISAPPROVED, BUT THEIR DISAPPROVAL WAS ONLY SILENCE. Below is information to keep in mind when teaching the content in this unit. This material is intended to help teachers consider the complexities of teaching about the Holocaust and to deliver accurate and sensitive instruction. Help students understand that the Nazis used words and phrases to influence and manipulate the masses. The term Kristallnacht is an example of Nazi “language.” Translated, Kristallnacht means “Crystal Night” (also often translated as “Night of Broken Glass”), a description that hardly captures the devastation and demoralization that Jews faced across Germany, Austria, and in areas of the Sudetenland in Czechoslovakia on November 9/10, 1938. There are numerous other examples of this same tendency in the language of the Nazi perpetrators: Sonderbehandlung (“special treatment”) for the murder of primarily Jewish victims, Euthanasie for a policy of mass murder of individuals with mental or physical disabilities, Arbeit Macht Frei (“Work Makes You Free”) over the entrance to Auschwitz. When the Nazis launched their plan to annihilate the remaining Jews in Poland in the fall of 1943, they called it Erntefest, or “Harvest Festival.” While this may have been a code word, it had the same grim irony that was reflected in Kristallnacht. Students will likely have a general understanding of what is meant by “the Holocaust,” but that understanding may come primarily from movies and a few assigned readings. Determine what students know about the Holocaust and how they have come to possess that knowledge. Teachers are strongly discouraged from using simulations when teaching about the Holocaust and other genocides. There is a danger that students might be excited by the power of the perpetrators or demonstrate a morbid fascination for the suffering of the victims. It may be useful, however, for students to take on the role of someone from a neutral country, responding to events: a journalist writing an article or editorial; a concerned citizen writing to his or her political representative; or a campaigner trying to mobilize public opinion. Such activities can highlight possible courses of action that students can take about events that concern them in the world today. testimony in the classroom, refer to Using Visual History Testimony in the Classroom. This unit provides an opportunity for students to discuss the value and importance of studying human catastrophes, in general, and the Holocaust, in particular. The lesson also provides an opportunity for students to consider the importance of examining both primary and secondary source materials when studying historical events and to begin to develop a common vocabulary for studying the Holocaust and other genocides. Differentiate between natural and human catastrophes. Develop a rationale for studying human catastrophes. Compare and contrast several definitions of the Holocaust. Distinguish between primary and secondary source materials and explain how each is important when studying historical events. Summarize the causes and effects of the Kristallnacht Pogrom based on analysis of primary and secondary source materials. 2 Discuss the difference between natural and human catastrophes. Emphasize that natural catastrophes are most often out of people’s control, whereas human catastrophes are the direct result of actions that people take. Who is likely to study human catastrophes (e.g., historians, social scientists, theologians) and why? What kinds of questions do you think people studying human catastrophes would want to answer? How might the questions be different from questions asked about natural catastrophes? 5 Explain to students that they will be studying about a time in history in which a great human catastrophe occurred. This catastrophe, the Holocaust (in Hebrew, Shoah), is the name given for the murder of some six million Jews by the Nazis and their collaborators. See corresponding Note for additional background. After reviewing the background information, have students volunteer possible reasons why this period of history is studied. Encourage students to consider that this period of history is studied because it is an important part of world history and because many of the underlying causes and effects of the Holocaust have had a profound influence on later historical events. 7 Write the word “genocide” on the board or on chart paper. Ask students for their thoughts on what the word means or in what context/s they have heard the word used. Ask students for examples of genocides based on material they may have studied in other classes or know from current events (e.g., Native Americans, Armenians, Tutsi, Darfurians). 8 Inform students that the United Nations has defined genocide as a crime. Before presenting the legal definition of genocide, ask students how they would define genocide to include the instigator (e.g., the state), the targeted group (e.g., an ethnic, racial, tribal, national, or religious group) and the intent (deliberate). Present the United Nations’ definition of genocide and have students compare their definition to the United Nations’ definition. Have students consider which definition they think best fits the Holocaust and consider why the Holocaust fits the definition of genocide. 10 Review the list of sources that was developed. Help students understand the difference between the primary sources and secondary sources on the list, and have them consider primary and secondary sources not identified on the list that might also be useful in studying the Holocaust. Review how the many types of sources (e.g., diaries, letters, historical fiction, written and visual history testimony, autobiographies, photographs, textbooks) may differ in the type of information included. Initiate a discussion on the accuracy of such sources and reasons why source material must be scrutinized for accuracy. 11 Explain that throughout this study of the Holocaust, students will examine many primary and secondary source materials. Explain that the Holocaust is one of the most documented events in human history and that the perpetrators produced much of the evidence. The Holocaust occurred in modern times, and the Nazi system was a highly bureaucratic one. When the historian wants to know what happened, when, and why, there is a sea of official records, private papers, and first-person accounts ready to be investigated. Naturally, sources must be studied carefully, and all require interpretation. Such documents highlight the historian’s tools and tasks, and bring complex topics into sharper focus. 1 Tell students that they will be studying several documents related to the same event in order to compare and contrast source material. To prepare them for this assignment, provide students with some or all of the background about the Kristallnacht Pogrom in the corresponding Note. 2 Divide the class into six groups and have each group select a recorder. 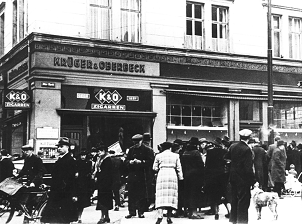 Distribute one of the primary source documents about Kristallnacht to each group and provide one group with a textbook that includes a description of Kristallnacht. Instruct students to discuss and make notes on what they learn about this historical event from studying the material. 3 After allowing ample time to discuss the documents, instruct students to pass their documents to another group. Group members should again discuss and make notes on what they learn about the topic from studying the material. Continue this process until all groups have had an opportunity to analyze all sources. Which of these materials are primary source documents? Which are secondary source documents? What were some of the things your group noticed while studying the two photographs? What questions, if any, did the photographs raise for your group? How is studying photographs different from studying other types of material? What did you learn about the Kristallnacht Pogrom by reading Heydrich’s instructions? What argument does Margarete Drexler use in her letter to the Gestapo to try to get her money returned? Why is this information important to know? How does the Description of the Riot in Dinslaken make the story of the Kristallnacht Pogrom a “human story”? What, if anything, did you learn from the textbook description of the Kristallnacht Pogrom that you didn’t learn from any of the primary sources? 5 Explain to students that another source of information about the Holocaust is survivor and witness testimony. Survivor and witness testimonies, unlike documents or words from a book, communicate the crucial role of the individual’s experiences through his or her stories. 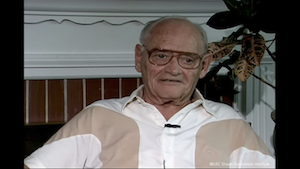 The interviewees in these testimonies are not “simply” Holocaust survivors and other witnesses. They are students, teachers, brothers, sisters, friends, and family members. They tell stories that recount anger, frustration, humor, surprise, relief, and fear. Viewing first-person, visual history testimony is a personal experience—no two people necessarily react to hearing a particular clip of testimony exactly the same way. Tell students that the visual history testimony that they will hear was collected by USC Shoah Foundation. 6 After introducing students to [L]Kurt Messerschmidt[/L], have them watch his testimony. Follow with a discussion using some or all of the questions below. How do you feel after listening to Kurt Messerschmidt talk about his experiences? What is meant by the term “testimony”? What role, if any, does memory play when giving testimony? What, if anything, do you learn about the Kristallnacht Pogrom from Kurt’s testimony that you didn’t learn from any of the other materials studied? How does Kurt’s testimony reinforce what you learned from other sources? What are the benefits and challenges of using visual history testimony? What role does the testimony collected by the Shoah Foundation play in the study of the Holocaust? How is this role different from the role and responsibility of historians? How is each important? List three things you learned participating in this lesson. Name two things that surprised you or that you didn’t understand. Identify one question you still have. In his testimony, Kurt Messerschmidt talks about helping the cigar shop owner pick up pieces of glass from the street. He says that he was sure some of the people disapproved of what was happening that night, but their disapproval was only silence. Why do you think that people are often unwilling to speak out when they see something wrong happening? What are the dangers of being silent in the face of injustice? Kurt Messerschmidt’s testimony about his experience during the Kristallnacht Pogrom is filled with rich detail and sensory images, and yet is very compact. Describe a particularly important experience from your life, crafting the memory in a narrative with a clear beginning, middle, and end, vivid details, and a sense of place. What thoughts and feelings come to mind when you hear reference to “the Holocaust”? What do you know about this event and how have you learned your information? Discuss your thoughts on the importance of studying the Holocaust. The additional activities and projects listed below can be integrated directly into the lessons in this unit or can used to extend lessons once they have been completed. The topics lend themselves to students’continued study of the Holocaust as well as opportunities for students to make meaningful connections to other people and events, including relevant contemporary issues. These activities may include instructional strategies and techniques and/or address academic standards in addition to those that were identified for the unit. 1 Visit IWitness (iwitness.usc.edu) for testimonies, resources, and activities to help students learn more about the Kristallnacht Pogrom. 2 Have each student or pairs of students prepare a list of three to five questions that they would like to ask Kurt Messerschmidt after listening to his clip of testimony. After developing the questions, students should go to Kurt’s Biographical Profile and see if the answers to their questions are included in the text. If unable to answer all of their questions from the Biographical Profile, have students go to IWitness (iwitness.usc.edu) and identify clips of testimony from Kurt’s full testimony that may help answer the questions. 3 If the class has a dedicated classroom wiki, have one of the students volunteer to pose a question to the group based on what was covered in this lesson and have other students respond. Another option would be for students to start a wiki based on Kurt Messerschmidt’s testimony and his decision not to be silent in the face of injustice. Students could then contribute to the discussion; add stories, videos, etc. As the class continues its study of the Holocaust, different students could take a leadership role in posting new material and questions and inviting others to respond. 4 Instruct students to gather relevant information from multiple print and digital sources about a recent catastrophe (either human or natural), including both primary sources (e.g., an interview) and secondary sources (e.g., a news report) regarding the event. Students should then write an informational essay that introduces the topic, compares and contrasts the information gathered from various sources, and explain how, if at all, the use of both types of sources led to a more complete understanding of the event. 5 Have students research how the Kristallnacht Pogrom was covered in media, especially newspapers, in their state, city, or town. After gathering relevant information, instruct students to develop an argument to support or refute the idea that this event was accurately covered and reported to the public. 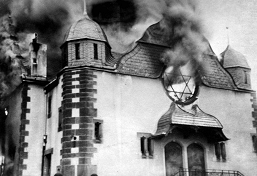 If unable to locate local or state coverage of the Kristallnacht Pogrom, research how this historical event was covered in national or international media. Have students prepare a written or oral summary of their findings and conclusions. 6 As an alternative to the activity above, have students research how editorial/political cartoonists in major national and international newspapers reacted to the events of the Kristallnacht Pogrom. Have students develop a PowerPoint or cloud-based presentation (e.g., Prezi), a written report, or decide on another format to present their work. Their presentations should include examples of political cartoons published following the Kristallnacht Pogrom, information about how people responded to the cartoons if possible, as well as their interpretations of the cartoons and what they learned from studying them.